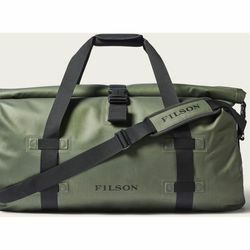 Filson Large Dry Duffle Bag. Filson's Large Dry Duffle provides water-tight protection on long trips. Rugged nylon fabric has a waterproof, abrasion-resistant polyurethane coating to keep gear dry even when fully submerged.